A low pressure system racing northward through the Carolinas will bring alternating rounds of rain and snow to the D.C. region from late Sunday morning into the overnight hours on Monday. Here's what you need to know. A low pressure system racing northward through the Carolinas will send alternating rounds of rain and snow into the D.C. region from late Sunday morning into the overnight hours on Monday. Wintry weather will make an impact in the D.C. area starting Sunday afternoon and evening with a mix of snow, sleet and rain, the National Weather Service said. Affected areas include, Annapolis, D.C., Upper Marlboro in Maryland, and Fairfax, Fredericksburg, and Charlottesville in Virginia. Storm Team 4 Somara Theodore says the system is expected to come into the region around brunch time. “The D.C. metro area will teeter along that rain snow line. Therefore, what may start off as some snow fall will quickly change to a mix including sleet and rain then as the (temperatures) drop Sunday night, that could change back to snow before it heads out early Monday morning,” Theodore said. 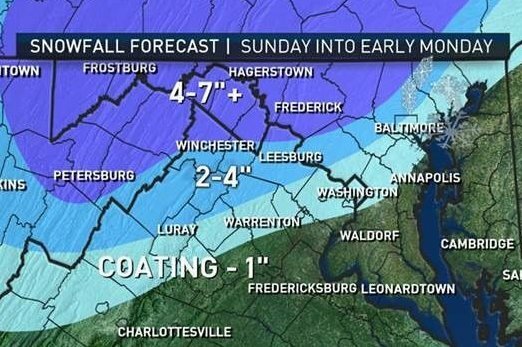 What NBC Washington’s Lauryn Ricketts called a “tug of war” between a colder air mass over the Great Lakes and a warmer current from the Gulf of Mexico will lead to precipitation bouncing back and forth from rain to snow somewhat unpredictably starting late Sunday morning. Temperatures dropping after midnight on Monday may cause disruption for the morning commute. A winter storm warning has been issued from 10 a.m Sunday until 2 a.m. Monday for areas in the farther north portion of the WTOP listening area like Frederick, Northern Loudoun, northern Montgomery and northern Howard counties. Those areas could see 4 to 6 inches of snow. A winter weather advisory has been issued for parts of the D.C. metro area including central Montgomery, Howard and Loudoun counties beginning at noon Sunday and continuing until 4 a.m. Monday. Snow may accumulate anywhere from 1 to 3 inches. Areas under the winter weather advisory are likely to see snow covered roads and issues with the Monday morning commute. The system will then depart quickly and bring about plenty of sunshine and breezy conditions for the next following days. The next week should be dry, though another disturbance will bring rain next weekend, said Theodore.